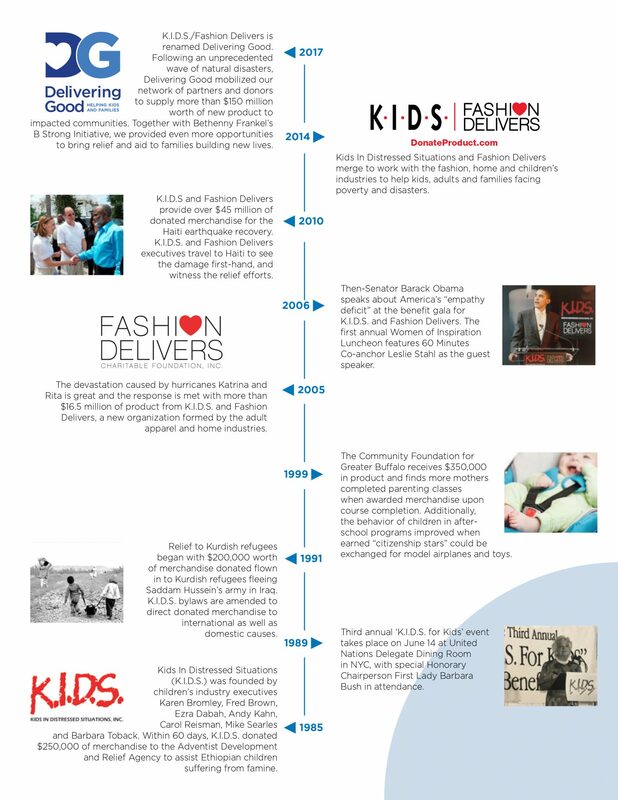 DELIVERING GOOD is the charity of choice for new product donations made by hundreds of companies in the fashion, home and children’s industries. Donating new merchandise provides these companies with a simple and effective way to help people in need. Founded more than 30 years ago, Delivering Good is a 501(c)(3) nonprofit organization that unites retailers, manufacturers, foundations and individuals to support people affected by poverty and tragedy. DELIVERING GOOD is an extremely efficient charity, with more than 98% of revenue dedicated to its charitable program of distributing apparel, accessories, shoes, home furnishings, toys, books and other useful items. Since 1985, over $1.8 billion of donated products have been distributed through our network of community partners, serving individuals and families affected by poverty and disaster worldwide. Complete the form below and someone will be in touch soon.